Anna Louise Strong, the daughter of Sydney Dix Strong, was born on 24th November, 1885 in Friend, Nebraska. Her father was a minister in the Congregational Church and was active in missionary work. Strong attended Bryn Mawr College in Pennsylvania and Oberlin College in Ohio. In 1908 she received a Ph.D. in philosophy from the University of Chicago. 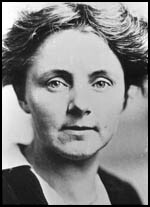 She developed left-wing opinions and was active in politics and was elected to the Seattle School Board in 1916. She argued that the public schools should offer social service programs for underprivileged children but she got very little support from other members of the board. 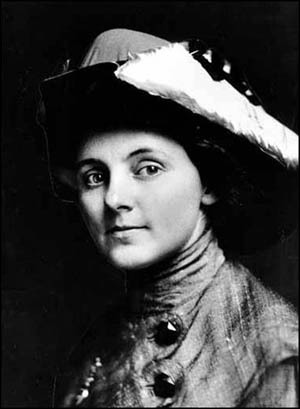 In 1916 she was commissioned by the New York Evening Post to report on the industrial dispute between the Industrial Workers of the World and employers in Everett, Washington. On 5th November, 1916, a shoot-out took place between 200 vigilantes (citizen deputies) and the IWW. Five strikers were killed and another 27 were wounded. Two vigilantes were killed but it was later discovered they were actually shot in the back by fellow deputies. Strong was appalled by this violence and became a supporter of the IWW and contributed material for its various publications using the pseudonym "Anise". Strong and the IWW opposed the United States becoming involved in the First World War. However, William Haywood, the IWW leader, did not agitate against it nor forbid members to comply with the draft. Nevertheless, politicians and employers' associations attacked the IWW as disloyal and dangerous. In a series of raids resulted in the indictment of Haywood and most of the union's leadership under the Espionage Act. After a long trial in Chicago, Haywood was sentenced to a fine of $20,000 and twenty years' imprisonment. Strong, like most people on the left, welcomed the Russian Revolution. In 1921 she travelled to Russia as a member of the Quaker Relief Mission. In 1922 she became the Moscow correspondent of the International News Service. Over the next few years Strong developed a reputation for being sympathetic to the Bolshevik government. Leon Trotsky praised her for supporting the New Economic Policy (NEP) that had been introduced by Lenin. "She approached the Revolution not from the aesthetic, or contemplative point of view, but from the point of view of action. Under the prose of the NEP, as well as under the dramatic events of the civil war, she was able to see, or perhaps at the very beginning, merely to feel, - the intense, stubborn, uncompromising struggle against age-long slavery, darkness, barbarism for new higher forms of life. When the Volga was stricken by famine, Miss Strong arrived in Russia for the difficult, dangerous struggle with hunger and epidemics. She herself went through typhus. In her numerous articles and correspondence, she tirelessly made breaches in that wall of reactionary lies that made the most important part of the imperialistic blockade around the Revolution. This does not mean, of course, that Miss Strong was hiding the black spots; but she tried to understand and explain to others how these facts grew out of the past in its conflict with the future." The journalist, Vincent Sheean, met Anna Louise Strong when she was in China with Mikhail Borodin and Rayna Prohme: "About Anna Louise (and this is strictly between us): she is a fine woman, but overpowering isn't the word for it. Nervous energy, physical strength, etc., etc., and a quite unbridled enthusiasm for every Communist fact or fancy. She nearly drove Rayna to distraction during that last week. This in spite of the fact that Anna Louise was overwhelmingly kind, efficient, and good. It was something Rayna couldn't help. She used to say to me: 'For God's sake get Anna Louise out and keep her out; I cannot bear having her in the room'. I did so as much as possible, but of course Anna Louise was very much there most of the time, or large parts of the time. For God's sake don't repeat this; I've told nobody but Bill about it; it seems rather hard on Anna Louise, who really meant so well and did so much; but the unfortunate woman has such a blustery character that one can't bear being with her much. I shared to the full Rayna's feeling about her, and was ashamed of feeling that way (as was Rayna). But there you are. Anna Louise's persecution mania (if that's what it was) was hardest of all to bear. Perhaps she has changed. In those days she thought everybody was in a conspiracy to make life difficult for her. She was terribly nervous and over-wrought, and broke into hysterics at any moment (long before we knew Rayna's illness was so serious, so it had nothing to do with that - it was only self-pity and a kind of morbid fixation on Borodin). I somehow don't think you'd get on very well with Anna Louise. Aside from all these other things, she has a remarkably superficial mind, given to statistical information of all sorts, surface materials, and incapable, usually, of going half an inch deep, except perhaps in things regarding herself. I distrust her reasoning and her conclusions, because I am familiar with the clerk-like statistical skimming of her mind." In 1930 Strong became editor of the Moscow Daily News. Other journalists who provided material for the English language newspaper included Rose Cohen, Ralph Fox and Tom Bell. According to a British Intelligence report Cohen and her husband, Max Petrovsky, were suspected of being a spy: "Bell was instructed by his chief in the office to be very friendly with her and not to tell her that she was being watched, also to discuss her husband's arrest as often as possible and... to elicit her views on the matter. He reported that she never spoke of her husband as being guilty, and although he put it to her that he must be guilty, or implicated in some way, otherwise the OGPU would not arrest him, she always replied: An error has been made somewhere." Cohen and Petrovsky were both executed. Malcolm Muggeridge was a journalist working in Moscow during this period and recalls meeting Strong and Walter Duranty of the New York Times, another Stalin apologist. "I withdrew to a sofa where I found myself sitting between Anna Louise Strong and Walter Duranty, the New York Times correspondent. Miss Strong was an enormous woman with a very red face, a lot of white hair, and an expression of stupidity so overwhelming that it amounted to a kind of strange beauty.... She had been around in Moscow from shortly after the Revolution, and allegedly, finding herself once in a car with Trotsky, the great man put his hand on her knee in what might have been taken as an amorous gesture." The first ever show show trial took place in August, 1936, of Lev Kamenev, Gregory Zinoviev, Ivan Smirnov and thirteen other party members who had been critical of Joseph Stalin. As Max Shachtman pointed out: "The official indictment charges a widespread assassination conspiracy, carried on these five years or more, directed against the head of the Communist party and the government, organized with the direct connivance of the Hitler regime, and aimed at the establishment of a Fascist dictatorship in Russia. And who are included in these stupefying charges, either as direct participants or, what would be no less reprehensible, as persons with knowledge of the conspiracy who failed to disclose it?" 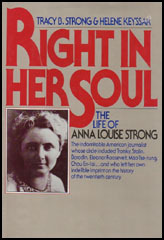 Anna Louise Strong defended the Great Purge: "The key to the terror, most probably, in actual, extensive penetration of the GPU by a Nazi fifth column, in many actual plots and in the impact of these on a highly suspicious man who saw his own assassination plotted and believed he was saving the Revolution by drastic purge... Stalin engineered the country's modernization ruthlessly, for he was born in a ruthless land and endured ruthlessness from childhood. He engineered suspiciously, for he had been five times exiled and must have been often betrayed. He condoned, and even authorized outrageous acts of the political police against innocent people, but so far no evidence is produced that he consciously framed them." In 1949 Strong and her boss Mikhail Borodin were arrested by the secret police. 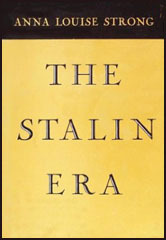 According to Roy A. Medvedev, has argued in Let History Judge: The Origins and Consequences of Stalinism (1971): "After the Second World War Borodin worked as editor in chief of the English-language newspaper Moscow Daily News; later he transferred to the Communist Information Bureau. Almost the entire editorial staff of the paper was arrested along with him, including the American journalist Anna Louise Strong, who was accused of espionage and expelled from the USSR." The authors of Reporting the Chinese Revolution (2007) have argued: "According to Philip Jaffe, his imprisonment was the direct result of his association with Anna Louise Strong and the enduring pro-Chinese, anti-Chiang Kai-shek sympathies he shared with her. Others assert that he was simply caught up in the anti-Jewish campaign of Stalin's later years." Malcolm Muggeridge commented: "Whether because of this past anti-Stalinist deviation, or for some other reason, in the stormy days of the cold war even she got arrested; an item of news which, I regret to say, like Oumansky's fatal accident, gave great satisfaction among former newspaper correspondents in Moscow. Some of them even sent congratulatory telegrams signalising the glad tidings. Her incarceration proved to be brief - I imagine that even in Lubianka, her presence was burdensome." After her release she moved to Beijing where she published a regular "Letter from China." During that time she developed a close relationship with the Chinese leadership. In an interview with Mao Zedong she discussed his views on the future: "Before the February Revolution in Russia, he said, the tsar looked very strong and terrible. But a February rain washed him away. Hitler also was washed away by the storms of history. So were the Japanese imperialists. They were paper-tigers all. The same thing would happen to all imperialists and reactionaries. Their strength lay only in the unconsciousness of the people. The consciousness of the people is the basic question. Not explosives of atom bombs but the man who handles them. He is still to be educated. After a moment, he added: Communist Parties have real power, because they awaken the people's consciousness." Anna Louise Strong died on 29th March, 1970. She approached the Revolution not from the aesthetic, or contemplative point of view, but from the point of view of action. Under the prose of the NEP, as well as under the dramatic events of the civil war, she was able to see, or perhaps at the very beginning, merely to feel, - the intense, stubborn, uncompromising struggle against age-long slavery, darkness, barbarism for new higher forms of life. When the Volga was stricken by famine, Miss Strong arrived in Russia for the difficult, dangerous struggle with hunger and epidemics. She herself went through typhus. In her numerous articles and correspondence, she tirelessly made breaches in that wall of reactionary lies that made the most important part of the imperialistic blockade around the Revolution. This does not mean, of course, that Miss Strong was hiding the black spots; but she tried to understand and explain to others how these facts grew out of the past in its conflict with the future." This was one of history's great dynamic eras, perhaps its greatest.... It gave birth to millions of heroes and to some devils. Lesser men can look back on it now and list its crimes. But those who lived through the struggle, and even many who died of it, endured the evil as part of the cost of what was built. The key to the terror, most probably, in actual, extensive penetration of the GPU by a Nazi fifth column, in many actual plots and in the impact of these on a highly suspicious man who saw his own assassination plotted and believed he was saving the Revolution by drastic purge... Stalin engineered the country's modernization ruthlessly, for he was born in a ruthless land and endured ruthlessness from childhood. He engineered suspiciously, for he had been five times exiled and must have been often betrayed. He condoned, and even authorized outrageous acts of the political police against innocent people, but so far no evidence is produced that he consciously framed them. Early in 1949 Mikhail Borodin was arrested. In the twenties he had been the chief political adviser to Sun Yat-sen and the National Revolutionary government of China. Sun Yat-sen, just before his death in 1925, had given him a letter to the Central Executive Committee of the USSR. It was the political testament of that great Chinese revolutionary, which the present leaders in Peking want to forget. After the Second World War Borodin worked as editor in chief of the English-language newspaper Moscow Daily News; later he transferred to the Communist Information Bureau. Almost the entire editorial staff of the paper was arrested along with him, including the American journalist Anna Louise Strong, who was accused of espionage and expelled from the USSR. I withdrew to a sofa where I found myself sitting between Anna Louise Strong and Walter Duranty, the New York Times correspondent. Miss Strong was an enormous woman with a very red face, a lot of white hair, and an expression of stupidity so overwhelming that it amounted to a kind of strange beauty. When in years to come I embarked on that Via Dolorosa, the American lecture circuit, I was constantly reminded of her; looking down on my audience from the podium, I saw row upon row of Anna Louises, as eagerly waiting for some crumbs of enlightenment from me as she did from Oumansky, or Borodin (under whom she worked on the Moscow Daily News), or the great Stalin himself. She had been around in Moscow from shortly after the Revolution, and allegedly, finding herself once in a car with Trotsky, the great man put his hand on her knee in what might have been taken as an amorous gesture. Whether because of this past anti-Stalinist deviation, or for some other reason, in the stormy days of the cold war even she got arrested; an item of news which, I regret to say, like Oumansky's fatal accident, gave great satisfaction among former newspaper correspondents in Moscow. Some of them even sent congratulatory telegrams signalising the glad tidings. Her incarceration proved to be brief - I imagine that even in Lubianka, her presence was burdensome - and she ended her days in Peking, where she was accorded a State funeral. A triumph of sheer staying power. From 1934 to 1939 Borodin was chief editor of the Soviet Information Bureau, but with no real power. Most of his collaborators from the China days died in the Stalin purges of 1937-39 or even earlier. Then came World War II, when Stalin had more pressing matters to think about. Events finally caught up with Borodin in 1949, when he was arrested. He died in detention in 1951. According to Philip Jaffe, his imprisonment was the direct result of his association with Anna Louise Strong and the enduring pro-Chinese, anti-Chiang Kai-shek sympathies he shared with her. Others assert that he was simply caught up in the anti-Jewish campaign of Stalin's later years. Anna Louise's own fate was perhaps the most extraordinary of all. Although she tried, in the most quixotic ways, to remain a faithful Stalinist to the bitter end, she was briefly incarcerated on spy charges, in 1949 - the year of Borodin's arrest - in the infamous Lubianka prison, and then deported. She traveled about for a time and then, in the fifties, made her way back to China and became an ardent Maoist. She was accepted in the inner circles and was one of the few foreigners to accompany the Red Chinese forces to Lhasa when they took over Tibet. About Anna Louise (and this is strictly between us): she is a fine woman, but overpowering isn't the word for it. Nervous energy, physical strength, etc., etc., and a quite unbridled enthusiasm for every Communist fact or fancy. She nearly drove Rayna to distraction during that last week. This in spite of the fact that Anna Louise was overwhelmingly kind, efficient, and good. It was something Rayna couldn't help. She used to say to me: "For God's sake get Anna Louise out and keep her out; I cannot bear having her in the room". I did so as much as possible, but of course Anna Louise was very much there most of the time, or large parts of the time. For God's sake don't repeat this; I've told nobody but Bill about it; it seems rather hard on Anna Louise, who really meant so well and did so much; but the unfortunate woman has such a blustery character that one can't bear being with her much. I shared to the full Rayna's feeling about her, and was ashamed of feeling that way (as was Rayna). But there you are. Anna Louise's persecution mania (if that's what it was) was hardest of all to bear. Perhaps she has changed. In those days she thought everybody was in a conspiracy to make life difficult for her. She was terribly nervous and over-wrought, and broke into hysterics at any moment (long before we knew Rayna's illness was so serious, so it had nothing to do with that - it was only self-pity and a kind of morbid fixation on Borodin). I somehow don't think you'd get on very well with Anna Louise. Aside from all these other things, she has a remarkably superficial mind, given to statistical information of all sorts, surface materials, and incapable, usually, of going half an inch deep, except perhaps in things regarding herself. I distrust her reasoning and her conclusions, because I am familiar with the clerk-like statistical skimming of her mind. She once wrote a book in thirteen days - her book about the Chinese revolution [China's Millions, which tells the story of Anna Louise Strong's escape from China with Borodin]. That shows you what I mean, perhaps. I hear her last book is very good (I Change Worlds: The Remaking of an American), a kind of political autobiography published in 1935, but haven't read it - or, in fact, anything else much, this year; I've been working so hard on my own new book. I raised the question about the threat of war between the U.S.A. and the U.S.S.R. The Chairman said that the talk of war was at present largely a smoke-screen which the reactionaries created to cover up the many immediate contradictions facing U.S. imperialism. American monopoly capital of course dreamed of destroying the U.S.S.R. but this aim was not so immediate. They must first wear down the American people's opposition to war, and then they must bring other capitalist countries under American control. Any war against the U.S.S.R. had to be done through other countries' territory, through Britain, France and China. So the American reactionaries used all this talk about fighting the U.S.S.R. to give excuse for attacking the American people's civil rights and living standards and for bringing the other capitalist lands under American control. He pointed out how, under this pretext, the U.S.A. was setting up military bases in many places and had already taken a very large area under American control. Chairman Mao laughingly illustrated his point with the tea-cups and little white wine cups on the table, placing a big cup for American imperialism and surrounding it with a circle of little wine cups for the American people, with a long zigzag line filled up with match-boxes and cigarettes to represent other countries all separating American imperialism from the Soviet Union, a big cup at the other side. The cooperation of the people, he said, was strong enough, if properly aroused, to prevent a third world war. But this cooperation against world war must be aroused, otherwise the war would come. The metaphor of "paper-tiger" was used during this talk and I was especially impressed, not only by the metaphor but by the way in which Chairman Mao, without knowing English, was able to correct the exact translation of his words. When he first said that reactionary rulers are paper-tigers, the word-was translated "scare-crow." Chairman Mao immediately stopped the talk and asked me to tell him just what a "scarecrow" is. When I replied that it is a figure like a man which peasants put up in a field to scare away crows, he at once expressed dissatisfaction, and said that this was not his meaning. A paper tiger, he said, is not something dead to scare crows. It scares children. It looks like a terrible tiger but actually, being made of pressed paper, it softens when damp and is washed away in a heavy rain. After this Chairman Mao used the "paper-tiger" in English, laughing at the sound of English words in a sentence, the rest of which was Chinese. Before the February Revolution in Russia, he said, the tsar looked very strong and terrible. But a February rain washed him away. Hitler also was washed away by the storms of history. So were the Japanese imperialists. They were paper-tigers all. The same thing would happen to all imperialists and reactionaries. Their strength lay only in the unconsciousness of the people. The consciousness of the people is the basic question. Not explosives of atom bombs but the man who handles them. He is still to be educated. After a moment, he added: Communist Parties have real power, because they awaken the people's consciousness.